Lots of food was devoured during the making of this blog. I was just too busy running and eating to take pretty photos. 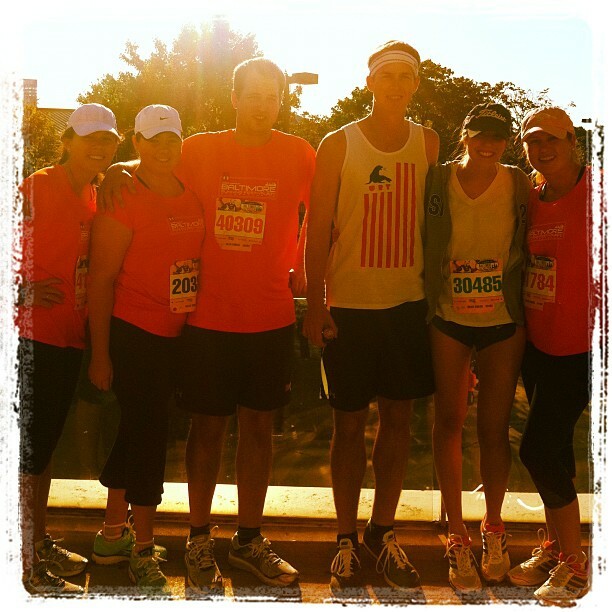 I along with a gaggle of family and friends ran the Baltimore Half Marathon this Saturday. 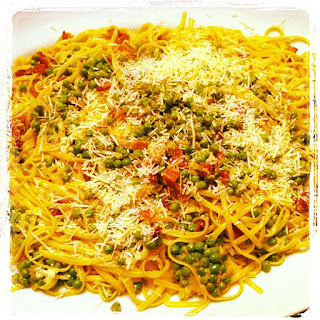 The night before was filled with pre-race jitters and lots of pasta (recipe below). We gathered in the kitchen to cook, talk, drink and plot how we would conquer the course. This was my third half marathon and although I didn’t break a personal record I had the best time with my comrades. The rich food and wine had something to do with both. Our post-race dinner was at Petit Louis Bistro owned by Baltimore’s premier team of restaurateurs, Tony Foreman and Cindy Wolfe. They put lots of love in to all of their restaurants and I highly recommend most of them. Petit Louis Bistro transports its diners to the heart of Paris. It is cozy, loud and overflowing with good wine and food. We stuck to the classics: creamy soups, tarts, steak frites, and rainbow trout doused in almond butter sauce. It was the ideal way to end our day at the races. We awkwardly waddled out of the restaurant satisfied with the food and ourselves. I look forward to redeeming myself in February when I fly to Austin to run the Livestrong Marathon. Here’s to good health, good food and good times. Bring a large pot of salted water to a boil. Cook pasta according to the package directions. When it’s al dente, drain and reserve about 1/2 cup of the pasta water. Heat oil in a large frying pan over medium heat. Add bacon and cook, stirring often, until it is well browned and most of the fat has been rendered. Remove the bacon from the pan and turn the heat down to medium low. Add shallot and garlic to the pan drippings and cook gently. Once gently browned, add the chicken stock, white wine, fresh peas, pinch of red pepper flakes, and salt and pepper to taste. Bring to a boil and then remove from the heat. Combine the sauce with the hot pasta, zest and juice of one lemon, reserved bacon and cheese, tossing well to combine. Add the reserved pasta water for a creamier sauce. Place pasta on a warm platter and serve immediately, passing extra grated cheese on the side. Great way to fill up prior to the run and I am glad to see you have such a passion for running. We all need to include some type of exercise in our daily routine that we enjoy instead of dread. Now I am craving pasta- I believe the picture is what did it. Yum! What a great pasta dish and CONGRATULATIONS on running the half marathon....you rock! I'm glad you had a good time and the post-race dinner sounds amazing! Well done! That's quite a feat, you should be so proud :) Great pasta too. How adorable is that recipe name!? Congratulations on running half the marathon! Great pasta and perfect way to fill up before the run!